Single LP version of limited 3xLP box set released exclusively on the Sublime Frequencies website. Sublime Frequencies presents one of its most ambitious releases to date: A spectacular three-LP box set of landmark recordings made in Burkina Faso by Hisham Mayet during three expeditions from 2013-15, housed in a breathtaking full-bleed slipcase with a 32-page booklet of Mayet’s stunning photography. 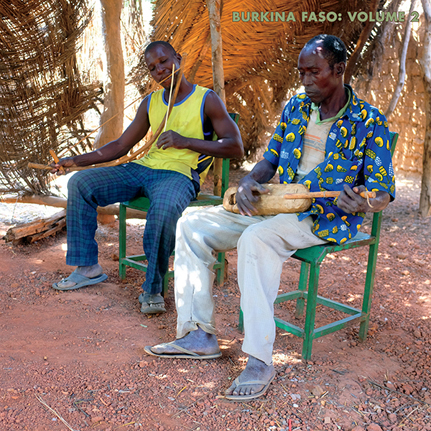 Despite political upheavals and the logistical complexities of recording in the bush, Mayet was able to compile a matchless overview of Burkinabé music from the Mossi, Bissa, Fulani, Dioula, Bobo, Samo, Lobi, Senoufo, and Bwaba people. Volume 2 spotlights Mossi, Bissa, Bwaba, Fulani and Samo music. One side 1, riveting string instruments such as the Mossi and Bissa koundé accompany gnarled, primal vocal epics extoling the virtues of kings and the common man. On side 2, the otherworldly sounds of the thianhou (reed zither) and the lolongo (bow-shaped mouth harp) levitate the listener into a blissful trance. Limited edition of 400 copies. Comes with a full-color insert of liner notes and a map of Burkina Faso.